At the Summer Solstice, we enter the first water sign of the zodiacal year, the Cardinal sign of Cancer. Water signs are the empaths of the zodiac; the fathoms of their emotional capacity like the depths of a mysterious sea. The Ocean is their mother and their place for healing, and like the elusively deep sea, Cancers are one of the most enigmatic signs. They may be highly practical, resourceful, and exhibit a high level of endurance, yet can be quick to recoil reactively if faced with resistance or unexpected changes to their carefully constructed plans. Water signs are tapped into their feelings as Air signs are tapped into their thoughts, for better or for worse. When the heart becomes heavy, or moods are low, the water element can be used to soothe and cleanse the emotional body. Soaking in herbal or salt baths, saunas, swimming, visiting the ocean, hot springs, and of course simply hydrating the body through plenty of fresh water intake are all good ways to incorporate its healing benefits, using the dissolving and diluting aspects of water to gently cleanse old emotional attachments, breaking down outdated barriers and flush out stewing resentments, frustrations, or grudges. In Hebrew, the word for chariot is Merkabah. It is called the vehicle for the astral body. The astral body is analogous to the Emotional Body. A Merkabah looks like a 3 dimensional hexagram – an upright and an upside down pyramid merging together. Here the Merkabah is expressed as a Yantra by the artist Michael Bennett on the Left, and overlaid with Da Vinci’s Vitruvian Man on the Right. The center shows the BOTA version of the Chariot card. The Key of the Chariot is the vehicle which moves you forward, implying that you are on the right path, and that you have the roads open before you. The Charioteer’s vestment is adorned with gill and fin-like detailing and the water behind him suggests that he has already completed the inner part of his journey and now needs to proceed forward in a tangible and outward manner. The ruling planet of Cancer is the Moon. (one of the 7 classical planets – the moving bodies across the sky visible to the naked eye) In the Tarot, the Moon corresponds to the archetype of the HIGH PRIESTESS. As the Moon rules Cancer, so does the High Priestess rule the Chariot. She is the keeper of Secret Wisdom. The personified Vault of the Adepti. Like the Magician, she has access to the Highest Realms, yet she demands great respect from those seeking her guidance. Her keyword is Discretion, as she only conveys her knowledge through the clarity of her presentation, her actions, and her very essence. The High Priestess leaves plenty hidden behind the veil, safe from the irresponsible masses, who only see their projections upon her. 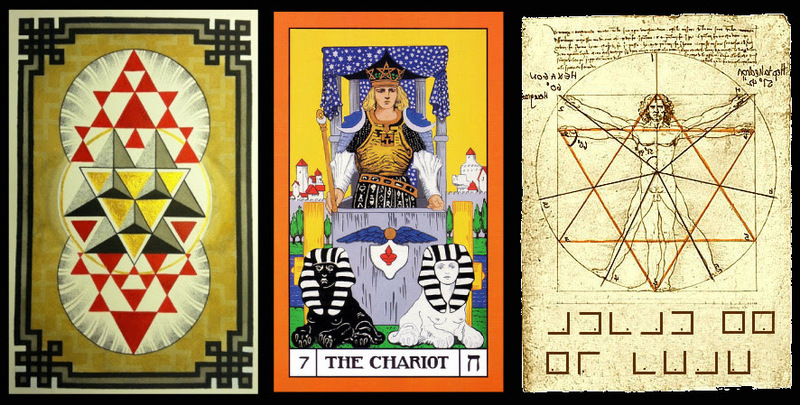 The High Priestess – The Moon – Discretion, ruling over Cancer – the Chariot – The Vehicle. Mercury will move through the sign of Cancer from June 30th until July 28th, bringing an opportunity to connect more deeply through the expression of feelings than ideas, especially as it shares the sign with Venus which entered Cancer a few days ago and will leave on the 13th of July. The Moon will greet these two travelers over July 4th and 5th. and yet both swimmer and log; wise man and fool are subject to Law.